Small Reflections: Who else is a Pisces out there? Yes, I'm a Pisces ... (actually on the cusp) ... born February 23rd when dinosaurs roamed the earth. Although I subscribed to the Daily OM when I first started blogging, I seldom read my Horoscope or the Daily Message because there's just too much of interest out there in this virtual world and not enough hours in the day. However, after spending considerable time responding to comments on each of my blogs (and let me add thank you very much to those who take the time to write) and emails, I rushed upstairs to shower and dress because I'm meeting a friend for breakfast this morning around 9:30. She's having some medical tests done first, so the time frame isn't fixed. So it happened that (upon returning downstairs as I sat down at the computer) I saw the following. You may feel energized and enthusiastic about your activities today. You may feel a new sense of motivation about your goals, or you could come up with an exciting new direction for a current project. While strong enthusiasm may help you quickly move your projects forward, you may also wish to give some thought to getting organized today so you can move ahead efficiently. Simply take some time to review your plans in detail, and see if there are ways to improve your productivity or streamline your efforts. It may be helpful to make a list of the tasks you want to accomplish and any action steps that will help you reach your goals. Then you can map out a clear progression of actions that will help you bring your goals into being. With an organized plan of action, we lend structure to our enthusiasm and enhance our ability to manifest our dreams in reality. We often let our enthusiasm take the lead, which can result in hasty or ineffective actions. If we instead take time to review our goals and devise more efficient plans, we can improve our productivity and lessen the amount of time and effort we must devote to manifesting our dreams. With an organized plan and an optimistic mind-set, we can accomplish more than we believed possible and achieve our goals with ease. By taking time to get organized with your plans today, you will have a clear blueprint for success and can let your enthusiasm fuel your desire to excel. Apparently, I'm supposed to add "structure" to organize my enthusiasm. I've avoided "resolutions" entirely for years ... decades even, and once I retired from teaching in June of 2001 ... I released my long-practiced over-developed obsessive need to plan at all. Instead, I've opted to take life as it comes ... enjoying each moment for whatever it brings ... rowing, no drifting, "merrily down the stream" just as I once did as a child. I'm happier, healthier, and (according to friends and family) more relaxed, calm, and fun to be around. Therefore, I think I'll continue as is ... at least for today. I've always subscribed to the philosophy "If it ain't broke, don't fix it." If drifting is working for you, keep on drifting. You may be surprised at where the current will take you. I agree with Eve...if drifting works well for you, then there's not need to jump ship. You know, it doesn't surprise me one bit that you are a Pisces! Just flow, baby, flow! Do these words belong in the same sentence? Note: I couldn't bring myself to putting them on the same line! Thanks for all the support for my enthusiastic resistance to any kind of structure and planning. FYI, Carol and I enjoyed a leisurely breakfast (sharing a tasty vegetarian omelet with hobo potatoes - yum! ), then came back here to visit awhile and give some "luv" to Ms. Kitty and Molly because neither of us is "into" shopping these days. I got Carol to take some video clips of Molly catching her over-sized tennis ball ... so perhaps I'll post one so you can see this acrobatic pooch in action. Carol just left and I'm checking in here already ... showing just how addictive this blogging thing has gotten for me. Eve - that's certainly my philosophy these days and I'm open to whatever possibilities arise. Mama Zen - I'm flowing ... and loving every minute! Dream - that's so perfect! It's how I felt when I read the "horror" scope initially. Since none of you fessed up, I'm assuming I'm the only Pisces swimming in this pond today. 'Tis good to have "accepting" buddies to egg me on. I've always resisted drifting, but sometimes it has been forced on me. I'm flashing back to when my son was a newborn and I was an inexperienced, terrified, overwhelmed mother (okay, so maybe that hasn't entirely disappeared). Nathan refused to be put down and so I was completely forced to let go, to drift. I couldn't plan, I couldn't organize anything. I had no choice but to exist in the moment and float along with him--and it was wonderful! 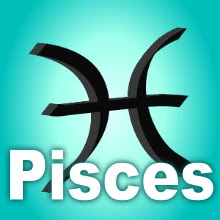 Enjoy your drifting--all Pisces are not alike--you don't all need the same things!